The Jets came to Telford with a very short bench. The Tigers looked to be in good spirits during the warm up after Saturdays win in Manchester. The Jets opened the scoring with a soft goal that passed under #41 Zack Browns pads 3 minutes into the game. The Tigers were unable to take advantage of the first penalty kill of the game even though they peppered the Hull keeper with shots. Having Andrew Bowater in goal for the Jets looked as if it could be a challenge for the Tigers. Even though the Tigers pressured in the first period the Jets managed to score 3 more even handed goals bringing the score to 4-0 at the end of the first period. The second period was not good for the Tigers, at no point did the lads seem to settle down and take control of the game. #53 Filip Supa was able to find the net at 30:16, this was the only Tigers goal of the game. The Tigers found themselves unable to take advantage of the 4 power plays in quick succession during the second period, even when we found ourselves with a five on three for just over a minute, the Hull keeper proved difficult to score past. As soon as the Jets were back to full strength they were able to score the fifth goal of the night. The Tigers came out in the third period and regained control of the game enabling the Tigers to spend more of the period in the Jets zone. A late hit penalty by #27 Callum Griffin put the Tigers in Penalty kill for the last two minutes of the game resulting in the Jets scoring the sixth and final goal of the night. 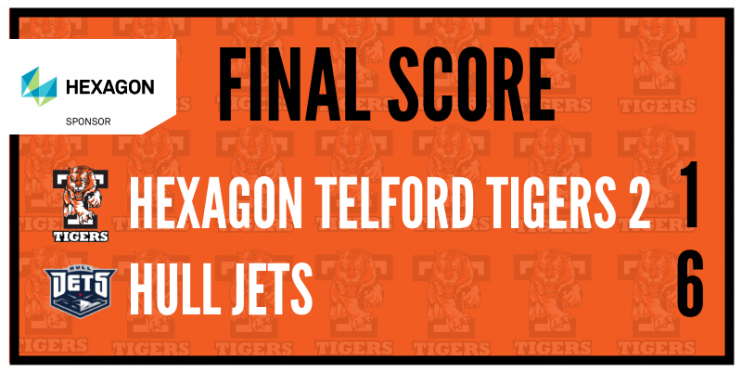 A bad day in the office for the Tigers 2 team, outshooting the Jets 46 shots to 33 saw the Hull keeper take man of the match, while #59 Jordan Jolly took man of the match for the Tigers. “We came out far too slow for my liking in the first period and seemed to lack energy which isn’t good enough, especially when you’re playing at home against a short-benched team. To gift them 4 even handed goals in the first 20 minutes absolutely killed us and we struggled to transition up ice with speed and jump on those second scoring opportunities that were in and around their net. As a unit we have to be harder to breakdown and we have to move the puck with speed, we went to Altrincham and did it, but tonight we didn’t.